A fatal wildland fire that began one week ago Friday has grown to nearly 33,000 acres and destroyed more than 50 structures in Monterey County south of Carmel-by-the-Sea, Cal Fire officials said. The Soberanes Fire began on July 22 in Garrapata State Park north of Big Sur and has extended to 32,930 acres as of Friday, Cal Fire officials said. There are 4,277 firefighters working to extinguish the blaze that has destroyed 41 homes and 10 outbuildings, according to Cal Fire. Roughly 350 residents have been forced to leave the area while an evacuation warning remains in place for people in about 2,000 structures threatened by the blaze, which has also damaged two homes and two outbuildings, agency officials said. The agency is utilizing resources on the air and ground to battle the fire, which was 15 percent contained late Friday, Cal Fire officials said. A private contractor who died when a bulldozer he was operating overturned on him sometime between Tuesday night and early Wednesday morning has been identified as Robert Oliver Reagan III, 35, of Friant, a community in Fresno County, agency officials said. Cal Fire's Serious Accident Investigation Team has been tasked with looking at the circumstances surrounding Reagan's death, according to agency officials. Crews expect to face high temperatures today that will reach the 90s and low humidity levels combined with steep and rugged terrain with limited access points, agency officials said. Investigators are figuring out what started the fire and estimate full containment will be reached on Aug. 31, Cal Fire officials said. The county is under a state of emergency declared Tuesday by acting Gov. Tom Torlakson, the state's superintendent of public instruction who is filling in while Gov. Jerry Brown is away in Philadelphia for the Democratic National Convention. The state's Office of Emergency Services has issued a Fire Management Assistance Grant that will help make sure necessary resources are bought in to help douse the fire, state officials said. The grant also allows local, state and tribal agencies to be reimbursed for any eligible expenses, according to state emergency officials said. 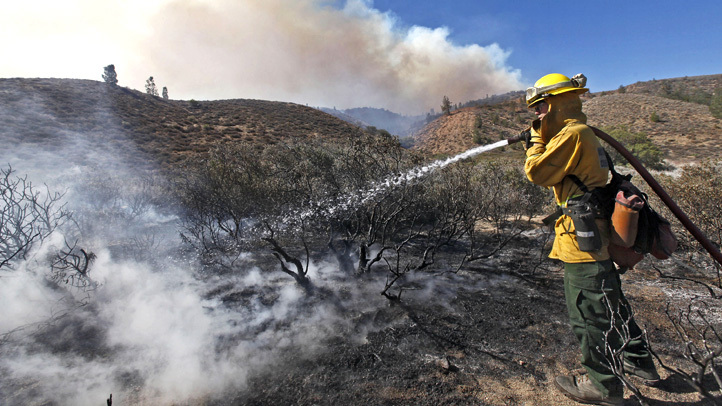 Any trails or roads leading into the Los Padres National Forest are closed in addition to state parks in the fire area, parks officials said. An evacuation center at Carmel Middle School closed at 8 a.m. today because of low demand by people affected by the fire, agency officials said. Pet owners can contact the Society for the Prevention of Cruelty to Animals for Monterey County if they need help sheltering, rescuing or feeding their animals by calling 831-373-2631. As of Friday, the shelter is caring for 49 pets evacuated from the blaze, SPCA officials said. The nonprofit is also holding an adoption event for 94 pets starting today through Sunday to help make room for animals displaced by the fire at its shelter located at 1002 Monterey-Salinas Highway in Salinas, according to the SPCA. People impacted by the fire can receive assistance by calling the Monterey County Department of Social Services at 800-755-4400 or the American Red Cross of the Central Coast at 866-272-2237.